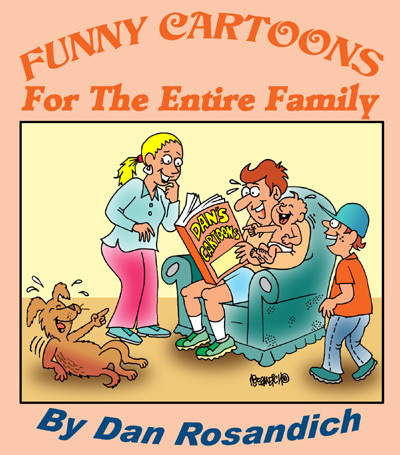 New cartoon web site relaunch after a complete overhaul of the galleries, the structuring that included a new menu layout, and then adding the thousands of cartoons into the database. 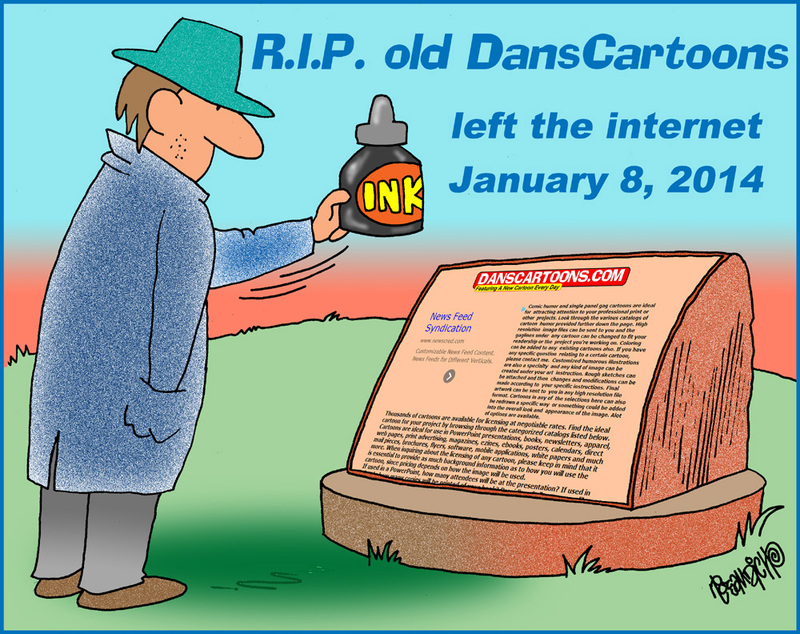 To commemorate my old site I created a “so long” RIP cartoon to make it somewhat official, and created a new “Blogs Away!” panel to introduce this new ToonBlog that will act as a sort of nerve-center to offer insights on new cartoon related news and information on images I create or add into the mix here at DansCartoons. To any regular visitors, bookmark the site and in fact, you also have a new option to actually “subscribe” to this blog where you can enter your email address in the form under “Get ToonBlog Via Email” if you forget to drop by or logon if you’re busy. The new rebuilt site was a work in progress due to having to learn a whole new web editor and understand all of the functionality of components and the way each of those works but after about one year of intense study and many stumbles, I finally attained the way I wanted things to work and to appear. Some may think “why not let someone build it for you?”….yes, I could have done exactly that but then I would never have any control over how the final look of the site would be or how it performed for the end-user. Losing control over something like this was not an option. While I was in the midst of all this, my computer’s operating system began to give trouble along with the hard drive going into critical failure. This was yet another set back that had me scrambling but I have a good tech person that was able to prevent any potential data loss on my hard drive and all files were uploaded onto their onsite web server while a new expanded hard drive was installed. My advice to anyone using their system for business is to be certain to backup all information on their computer’s hard drive to an external system and also to a site like iDrive or one of the many other reliable services that are available based on your needs. Aside from those problems, I also encountered other difficulties in having to re-work an existing photogallery component that wouldn’t work in conjunction with a customized theme I had developed for the new site – what that caused was another slow down in having to re-edit and reload all existing cartoons in an entirely new image galley layout using a completely different component but it was worth it due to the fact that I was pleased with that specific layout and how it allows visitors a more “user-friendly” experience in that they can click through huge galleries of images . . . one at a time, with ease. My old site had basic thumbnails that had to be clicked on once, then the user had to click the back arrow to get back on the thumbnail gallery to review the next cartoon and so on. Overall I hope the new site and site structure is a better experience for followers of my cartoons and be certain to let me know your thoughts on what I can do to improve things as I always look at my catalog as a work in progress. The difficult task is now finished and I can now focus on more of a regular “production schedule” and hope to share new cartoons right here on the ToonBlog. Your input will be appreciated on what can be done to improve the site and this page in specific. Keep laughing and don’t forget to come back for future postings a plan to share here. If you’re on the go or can’t get to a computer as often as you like, be certain to fill in your email address where you can have the newest ToonBlog emailed to you in that “Get ToonBlog via Email” form in the column on side of the page. 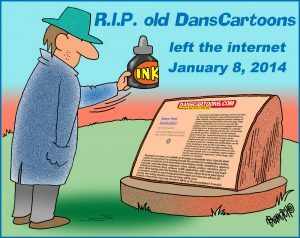 And hope you like the new cartoon web site relaunch – THANKS!